Vintage from Paul is pleased to offer these Jackson China Jac-Tan Red Scroll Dinner Plates. 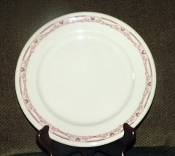 The Jackson China Jac-Tan Red Scroll Dinner Plates measure 9-3/4 inches in diameter. Each of the available JJackson China Jac-Tan Red Scroll Dinner Plates is in pristine condition; the colors are vibrant, graphics crisp. These plates appear to be unused. The Jackson China Jac-Tan Red Scroll Dinner Plates are marked with "Vitrified Jac-Tan Jackson China, Made in USA, J-25" The date code J-25 indicates a 1935 date of manufacture. THE HAMILTON CLUB was organized on April 9, 1890 on the twenty-fifth anniversary of the surrender at Appomattox. Its first home was 21 Groveland P?rk, the premises being occupied on September 16th, 1890. On May 1st, 1895, the Ckib removed to 3014 Lake Park Ave- nue. Soon thereafter a movement was begun for a downtown location, and on March 14th, 1898, the upper floors of a building on the south side of Madison Street, just east of Clark Street, were occupied. Another ad- vance was made May 19th, 1902, when possession was aken of the building at the northwest corner of Monroe and Clark Streets, where, for ten years, the Club grew and prospered.